I am so excited to get started using this cash flow management software. I’m a business owner and run my household finances as well so the software will really simplify my life. Sandra’s coaching gave me a lot of great ideas to work with to correct the cash flow situations I am dealing with in my business. I thought it would be hard to do, but I thoroughly enjoyed all of the coaching and can get on the road now to achieving my goals. Sandra, your coaching allowed me to realize how wasteful I have been with my company’s hard-earned income, and gave me the tools to act responsibly and be accountable for my cash flow management. 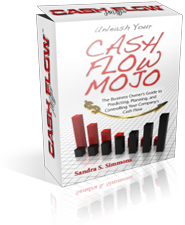 I have known Sandra Simmons since 2009 and have been using her company’s cash flow management software since that time with outstanding success. When she introduced her new Cash Flow Mojo (CFM) platform I converted to it as one would do with an upgrade on any great system. I own and run a busy Chiropractic office and pride myself on the fact that we stay ahead of the curve when it comes to using not only the latest management technologies to run our office, but the most cost effective. I learned from my experiences over the past 25 years in practice that my most precious commodity is time. I used to spend an agonizing amount time weekly on organizing bills for accounting, saving for taxes, budgeting and plotting our financial strategies and creating reserves that would guarantee a solvent future for the practice and our future retirement. I had accountants and bookkeepers on my payroll but all they could do is work from what I created. Even with all their knowledge, help and advice I was still missing the key that would ensure that my office financially operated on a day to day basis towards solvency both short and long term. The truth is I was flying blind financially and I couldn’t figure out why my debt kept increasing when we had so much income, or why I didn’t have any savings set aside. By using this system it made me aware of how much income I had to spend each week and gave me total awareness of where and how each dollar should be allocated so that not only were we solvent, but winning by creating a future reserve of income. It used to take me hours to handle this distribution of income and now I do my financial planning in less than 30 to 40 minutes each week. With that my reserve accounts are building, my debts are being correctly handled and paid and we know what our income is, where it should go, and can set up targets and strategies to increase our income. Cash Flow Mojo is very simple and easy to implement and apply. I can’t imagine how we did what we needed to do before we had CFM. This program is my secret weapon for financial stability. Sandra, thank you for creating CFM and for helping people like me who utterly hated to do the financial planning in their business. By creating this program, you made it easy and fun to apply the Laws of Financial Success so that I can win in this game. I highly recommend CFM to anyone who wants to financially succeed in any business or personal endeavor they choose. For the first time in 3 years I have gained the knowledge to control the finances of my business. I am now on my way to achieving my financial goals. Thank you Sandra Simmons for your help. Although we had the Cash Flow Management software for quite some time, we never used it. But, finally, we made time to talk to Sandra Simmons, where she asked us about our most pressing financial and business concerns and then actually addressed them. From that, we signed up for a consultation. The results are many after such a short input of time. Our software is now in use, AND we have a simple financial program to follow which will get us on the road to effectively managing our cash flow and making more money. Additionally, Sandra gave us some great, easy and inexpensive marketing ideas that make sense and are relatively easy to accomplish. One in particular was brilliant! Sandra gave us effective direction so that I am making more effective use of my time and not spinning my wheels. This was a GREAT investment of our time. Thanks Sandra. Here’s to making and having more money! T. G., G.M. – Construction Co.
Sandra, The customer service experience that I had and always get from you and your company is phenomenal! I don’t feel like I’m a burden when I call you, like at times when I deal with other people or companies, it seems like if I’m bothering them!!!! But with your company it is like really getting help without having to go through an unpleasant experience. I know it was a little late in the evening when I needed your help, and still you did not hesitate. Your software product is just awesome! It definitely delivered what it promised. I have so much peace of mind knowing that my auto repair shop and I are well organized financially. PRICELESS !!! I can honestly say, the Cash Flow Management software, and working with Sandra, has single handedly been the most important financial decision I have ever made in my life. When I called Sandra, I was 70k in debt (consumer c/c, medical, office build out, business loan, etc.). I run a very successfully wellness center, and with that success, I still couldn’t overcome my huge amount of debt. The stress was overwhelming, and it was consuming my thoughts every single day. I was accruing a few hundred dollars in credit card interest every month, and didn’t even know it. I had no idea what my monthly business and personal expenses were, had no plan to reduce my debt, nor did I have any savings put aside. I would pay bills as they came, with no direct strategy for that either. Every quarter I would stress not knowing if I would have enough money to pay my business taxes. I was getting letters from debt collectors every day, with no idea how they obtained this information. I was in a financial mess to say the least. I knew by the end of my first call with Sandra that I was going to be ok, and make it through this. Her confidence and certainty assured me I was in the right place. We figured out every business and personal expense I had to the penny, and made sure that I was not spending more than I was making every week. That sounds like a simple enough concept, but you will be amazed how many people have no idea exactly what they are spending every month. I thought I did, but I was way off. For the first time, I started paying myself first, and was putting small amounts of money into set aside accounts while I tackled my debt, and started to get back on track. Within a few weeks, I started to feel more confident, and the debt and all associated stresses were coming down. At the same time, we discussed ways to really focus on the promotion of my business to increase our office revenue. I am so happy and proud to say, that in THREE months of coaching with Sandra and using her software system, I became completely debt free. Something that I didn’t think I would not be able to climb out of without financial assistance, I did in a few short months. Now, 8 months later, I have socked away 80k, and we are on our way to having our best year to date financially in our office. Again, coaching with Sandra and using her system has changed my life, and I couldn’t be more grateful to her for that. I have used this software program for a Fortune 100 company that does a gross of 2.5M a year. It enabled me to turn the company around and move it from red to black within one year. I was also able to establish a reserve account of over $75,000. If you follow the Cash Flow Mojo program, you will definitely be able to work yourself out of debt, set-up various reserve and savings accounts and increase your profitability. The program itself is very user friendly and easy to use. I personally have known Sandra Simmons for several years and she knows what she is talking about. Her expertise in this area is beyond compare and I have personally witnessed what she has been able to do for various companies.